New Deal critic Amity Shlaes compares the president's healthcare plan to "The Matrix." US Democratic presidential candidate Senator Barack Obama (D-IL) is reflected in his car as he prepares to board his plane in Albuquerque, New Mexico, August 18, 2008. As a public service announcement, I offer readers two ways in which to realize that New Deal critic Amity Shlaes is not someone who needs be taken seriously. For the comprehensive, no-stone-left-unturned takedown, settle in with Jonathan Chait's superb "Wasting Away in Hooverville," published in the New Republic. Or, for a quick-and-dirty dose of enlightenment, just read Shlaes' newest column for Bloomberg News, "Obama's 'Matrix' Alters Reality of Health Care." 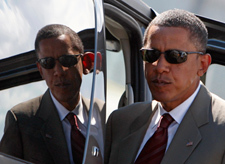 Every administration has a movie, writes Shlaes, and Obama's is "The Matrix." I'm guessing that since the "socialist" moniker isn't sticking, it's time to raise the ante and start depicting the new occupant of the White House as a malign artificially intelligent machine. The administration seems almost to relish the sinister aspect of government-run health care. Otherwise it wouldn't have created a position called "National Coordinator of Health Information Technology." That's a title worthy of Rhineheart, Neo's boss, who tells him, "This company is one of the top software companies in the world because every single employee understands that they are part of a whole...."
Peter Orszag, director of the Office of Management and Budget in the Obama White House, is a nice, smart man. But Orszag's facial features took on a resemblance to those of Agent Smith when he said recently: "There's a lot of momentum behind health care." Momentum: Something's coming, so accept it or run. Squeezed in between these ludicrous observations are some quotes from an American Enterprise Institute talking-point generator warning us that Obama's healthcare plan will require raising taxes. Fair enough -- but I'm still missing how exactly that equates to the exploitation of billions of human bodies as batteries to power a civilization of rogue AIs. "All this explains why panicked Republicans are ranging wide in their search for leadership," writes Shlaes. "A mere politician won't stop this Matrix -- they need a superhero." Actually, what Republicans need to do is accept reality. Americans want a decent healthcare system. If there is an analogy to be drawn from "The Matrix" that applies to the current political scene, it's that Americans have finally woken up, and seen the world as it really is. Eventually, if Republicans want to continue participating in the governance of the United States, they will follow suit.